If you are a serious backyard cook, you’ve probably heard of pellet grills. These backyard BBQ’s are loved for being versatile and make outdoor grilling practically effortless. With unparalleled flavors, just thinking about the savory scents soon to be wafting through the air is enough to make anyone’s mouth water. The original pellet grill, and ranking as one of the best is the high performance Traeger Pro Series 34. As you use this amazing outdoor appliance and cook succulent meats and perfectly crusted treats you’ll understand what we mean . However, before you rush online and browse through a million different options, there are three important issues you should be aware of going in. First off, pellet grills run on ¼-inch wide and 1-inch long pieces of compressed wood. 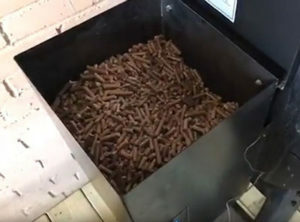 These premium wood pellets ensure they burn cleanly to a fine ash, it also means the pellets will burn quickly. Therefore, the very first thing you should look in a pellet grill is an efficient build that will prevent the grill from going through pellets like there is no tomorrow. Secondly, grilling (and smoking) is all about maintaining consistent temperatures throughout the pellet grill cooking process. A pro knows when to crank up the heat and when to bring it down to a dull murmur. This makes temperature control another must-have feature for pellet grill worth it’s weight. Lastly, since a pellet grill is a major investment you will be making for your backyard barbecuing, quality is another important aspect to take into account. With the endless pellet grills that are on the market, it can be daunting to settle for a specific model. However, one option that meets all the qualities highlighted above is the Traeger Pro Series 34 Pellet Grill. In addition to producing the smoked flavor that is synonymous with pellet grills, this unit is built to last, highly functional and efficient. As an added bonus, it is super easy to use. Here’s more on the Traeger Pro Series 34 Pellet Grill. A quality build is very important for a pellet grill. If both the interior and exterior are not well made, you will literally wear out your unit in no time. And, this is why Traeger spared no expense with their Pro Series 34 Pellet Grill. Like all Traeger pellet grills, the Pro 34 is built with longevity in mind. 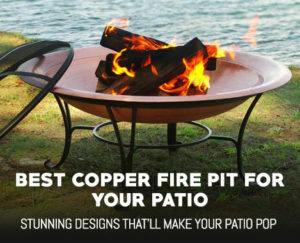 It features a powerful steel construction whose durability is reinforced with a powder coat finish that ensures years of grilling and smoking. As for the interior, the unit features porcelain grill grates, which offer durability as well as the blessing of easy maintenance and zero chance of rust. A sawhorse chassis base with solid all-terrain wheels completes the construction, giving the Pro Series 34 pellet grill linebacker-like stability that will effortlessly roll over paved areas, dirt, and even rocks. The Traeger Pro 34 combines good looks, user-friendliness, and portability in a classic pellet grill design you are sure to love. 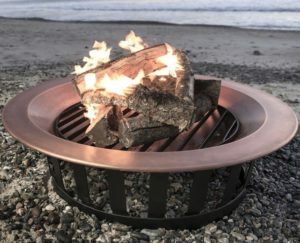 The entire unit is in black except for the hood, which adds a bit of color and flair to the grill with its bronze shade and etched-in Traeger logo. 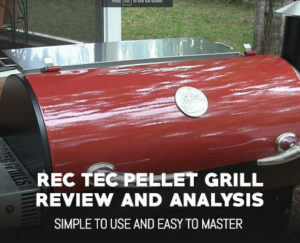 It’s looks however, can’t match up to the REC TEC Pellet Grill’s bold design. On one end of the hood is the grill’s fully enclosed pellet hopper, which offers the additional benefit of doubling up as an area for holding cooking equipment, ingredients, or refreshments for the cook to enjoy while waiting on food. 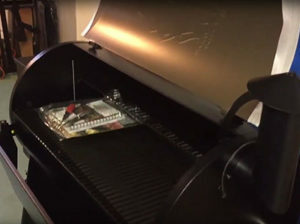 The pellet hopper also houses the controls of the grill, which include an on/off switch, a temperature knob, as well as a display that shows current cooking temperature. The other end of the hood features a drip bucket strategically placed to collect grease dripping from meat, thereby making for easy clean up of the grilling area once you are done cooking. A sawhorse chassis base supports the entire unit. 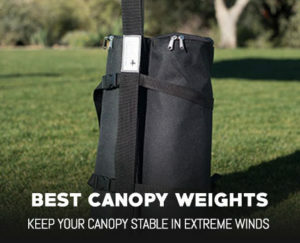 The base comes with easy-glide wheels and features EZ fold legs that allow you to pack up your pellet grill and take it anywhere you want to go. Once you reach your grilling destination, the wheels have locking casters that ensure the Pro 34 pellet grill stays put wherever you park it. Another fantastic feature about the design of the Traeger Pro 34 is that it allows you to use two meat probes (provided in the package) simultaneously to monitor internal temps when cooking different types of meat. Moreover, you can do this without even opening the lid of the grill. Digital Elite Controller – To ensure the very best possible flavor, the Traeger Pro Series 34 features a digital elite controller that helps regulate temperature at every stage of cooking. The controller has temperature settings that range all the way from a ‘shut down cycle’ and ‘smoke’ setting to a high of 4500. The best part is that this digital controller allows for amazing precision as you can adjust the heat in increments or decrements of +/-15 degrees. 18-Pound Hopper – At 18 pounds, the hopper of this pellet grill is just the perfect size to ensure convenience. Filling the hopper with pellets will keep the grill burning long enough to last through slow cook times associated with making things like briskets or smoking meat. The fact that you do not have to keep adding pellets means you will also save on fuel. Large Cooking Area – When it comes to grilling space, the Traeger Pro 34 goes beyond its duty as a pellet grill. In addition to a massive main grilling area of 646 sq inches, this pellet grill throws in an extra rack with 238 sq inches more of grilling real estate. This is enough space to cook as many as 40 burgers, 7 chicken, 32 hotdogs, and 9 racks of ribs. With all this room, you cook an entire meal (complete with the main course, side treats, and even dessert) all in one go. Since Joe Traeger introduced the very first pellet grill to the market back in 1985, the Traeger family has grown to become a leader in the grilling industry and even gained a large cult-like following in the process. So, you can never go wrong with a Traeger pellet grill as is clear with this Pro Series 34 unit. This pellet grill not only allows you complete control when it comes to adjusting cooking temperatures but also uses convection technology to ensure consistent temperatures when barbecuing. Additionally, the unit is easy to use and clean, large, offers 6-in-1 functionality, and even throws in some portability to the mix. What is there not to love about the Pro Series 34 pellet grill? If you’re looking for a great alternative, the REC TEC RT-680 is truly a beast that can go toe to two with the Pro Series 34. Check out our full review of it here.